Galadriel (S. ‘Radiantly-garlanded [crowned]-maiden’; from Q. Altariel) was the daughter of Finarfin son of Finwë (King of the Noldor) and sister of Finrod, Orodreth, Angrod, and Aegnor. She possessed the greatest beauty of the house of Finwë, being very tall and having the golden hair of her mother’s kindred. She was a leader of those Noldor who rebelled and forsook the Blessed Realm, for reasons of her own (she may have had a desire to one day rule over a small part of Middle-earth; her motives for rebelling were not connected to the theft of the Silmarils), and so became exiled. After she was separated from Fëanor and his kin, she and her people did not take part in the Kinslaying, and as a result, she was offered safe return to Valinor. But too filled with pride, she refused. Galadriel spent much of her early exile with Melian in Doriath, from whom she learned much wisdom. Before the Age had ended, she wedded her cousin Celeborn, and they had one child (Celebrían). Early in the Second Age, the two journeyed to Harlindon, where they dwelt for many years. They later went eastwards to Eregion, dwelling there for a time, but eventually they crossed the Misty Mountains and into Wilderland, where Celeborn made a realm for the Wood-elves of Laurelindórenan (Lothlórien). The Golden Wood became a secret realm, hidden from the knowledge of other Elves, and throughout the Second and Third Ages, Galadriel’s power was so great that Lórien remained safe from Sauron. 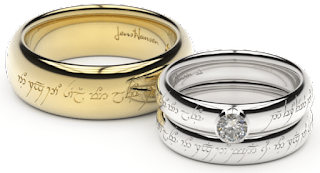 When the Annatar (‘Giver of Gifts’) appeared, guiding Celebrimor and the other Noldor of Eregion in the creation of the Rings of Power, Galadriel was immediately distrustful; as it turned out, she had been right: when it was revealed that the Annatar was Sauron, Galadriel counseled Celebrimor in the hiding of the rings, one of which – Nenya – she was entrusted with when Eregion was attacked. 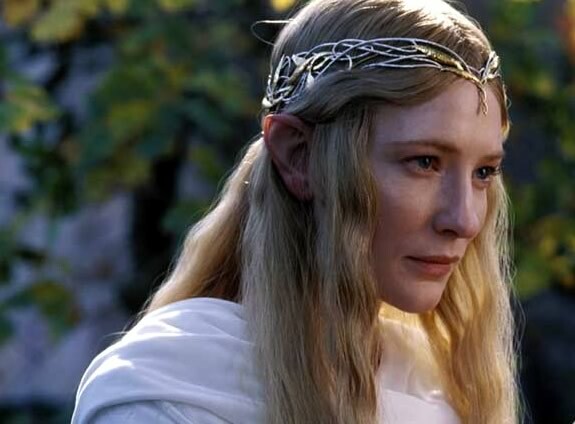 Little is mentioned of Galadriel or Celeborn early in the Third Age – until the formation of the White Council in TA 2463, which she hoped Gandalf would become the head of. She took in the Fellowship of the Ring after their escape from the Mines of Moria. It was here that Frodo offered her the One Ring, and in rejecting it, she also rejected her original desire for power which had led her into exile in the first place. After the Fellowship departed from Lothlórien, she continued to assist them in their quest: it was she who summoned the Eagle Gwaihir to rescue Gandalf from the peak of Celebdil (and she who nursed the wizard back to health); and it was she who sent word to Aragorn about the Paths of the Dead. At the end of the Third Age, after many years of sorrow and exile had passed, Galadriel was rewarded for her work against Sauron and her rejection of the Ring by being permitted to finally leave Middle-earth and return over Sea. Galadriel was also called the Lady of Lórien, Galadhriel, the Lady of the Wood, the Lady of the Galadrim, the Sorceress of the Golden Wood (by Gríma), the Mistress of Magic (by Faramir), the White Lady, and Queen Galadriel. You have put together some great info... Thanks. 1. Artanis : Her birth name in High Quenya. Quenya being spoken in Beleriand.